The project was conceived and designed to be operated with minimal impact on the lake and surrounding area. 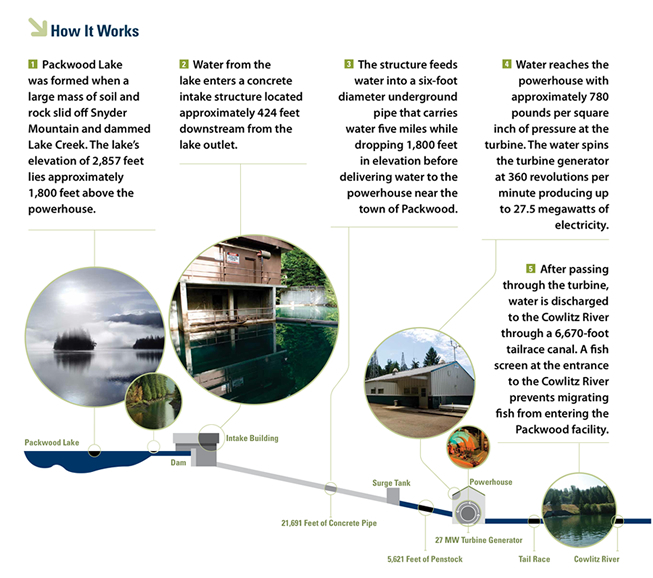 The power plant structures are limited to a small diversion and intake structure a short distance downstream from the outlet of Packwood Lake. A five-mile underground pipeline carries the water down the mountainside to a powerhouse. The 1,800-foot drop in elevation creates 780 pounds per square inch of pressure at the generator turbine, which produces the electricity. We pay roughly 14% of the cost of the project, and in return it recieves 14% of the output. A diversion dam on Lake Creek 424 ft downstream of the outlet from Packwood Lake feeds water to the powerhouse through a system of concrete pipes and tunnels. The 1,800 ft drop creates 780 pounds per square inch of pressure by the time the water reaches the turbine. We have a 14% off-taker agreement and receives roughly 3.85 aMW.